Ben Clanton's Squiggles and Scribbles: HAPPY 2016! I'm way excited for 2016! This year is to be full of new adventures for me and for my family. The biggest thing being that I'm going to be a dad! Still can't quite believe it. Also, I'm likely moving yet again, but sticking in the PNW. Why must Seattle be so expensive?! I have two books coming out this year IT CAME IN THE MAIL and NARWHAL: UNICORN OF THE SEA (A NARWHAL AND JELLY BOOK). Fingers crossed that they find some (many?) friends. 2016 also marks my fourth year as a published author/illustrator. VOTE FOR ME came out in April of 2012! 4 MORE YEARS! That is my writing slogan. Thank goodness I'm not limited to two terms. Lots of fun projects in the works this year with dinosaurs, ghosts, robots, sea creatures, and mutant potatoes starring in my latest endeavors. 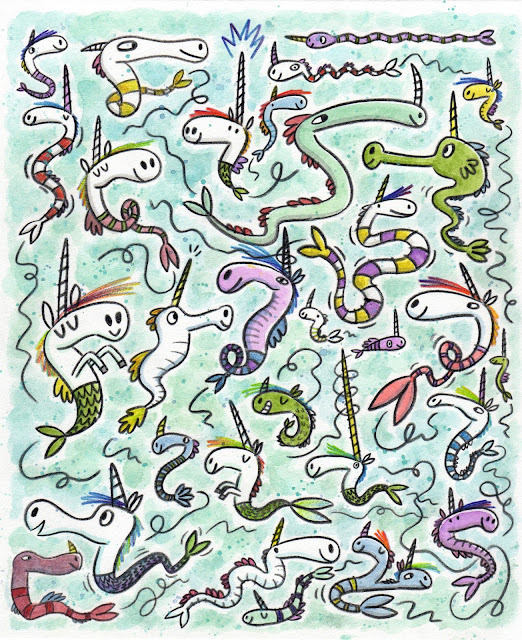 And then for some strange reason I've been drawing oodles of mermicorns to kick the year off. I'll take it as a sign that it is going to be a magical year. Hope yours is! !